1-abc.net Database - Maybe the easiest data base tool available! Maybe the easiest data base tool available! Do you have a collection of books, CDs, DVDs, old stamps, special pencils, exotic animals, vintage pictures or classical photographs? Do you want to organize your personal data, your homework, your customer addresses or your wine cellar? Are you always disappointed that big and professional data base tools are slow and overloaded with so many features you will never need? 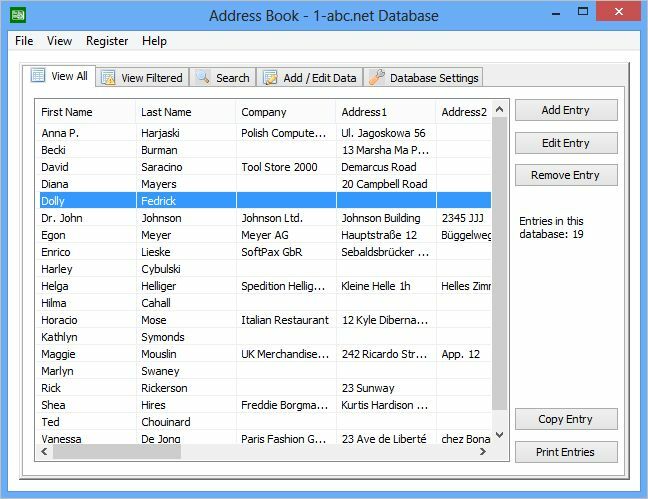 1-abc.net Database is your perfect tool to organize any kind of data just as fast and easy as possible! Add some columns and name them as a base for your data, of course you can always add and remove columns later. Then enter as much data as you wish, your computer hardware is the only limit for the amount of data sets. Sort your data just by clicking a column headline, copy a data set to Windows clipboard or print out your whole list on a local printer or via network. You can edit single entries easily and you can remove existing entries faster than you believe. Additionally, our fantastic search options allow you to filter your data just by entering a whole word or wild card expressions like '%e' for all entries in a specific column ending with letter 'e'. The 'View Filtered' screen will show you a list of all this data you search for and keeps it until you leave the program. We decided that it makes no sense to invent a new data format for our 1-abc.net Database files because there are already too many of them available, so all your data is saved to a conventional *.csv file which can be imported and exported by nearly every calculation and data base program. You can even edit such files in Windows Notepad if you like. 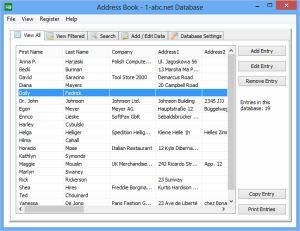 With 1-abc.net Database your data can be organized much easier than you ever thought!